So after I awoke from my slumber and ate some breakfast, I headed out for my three and a half hour ride. It started out as usual for a Saturday ride; nice temperature not too bad when it comes to the wind and lots of people out riding their bikes, but the second it hit noon it seemed as though everyone had stopped riding; then it got hot and the wind really started to picked up. So now I understand why everyone is always wanting to ride early in the morning, its kinda nice but I tend to I like hard though, its good for your training. My ride was pretty straight forward, I only had just easy tempo stuff today so it wasn’t like I was really hitting it. After the ride I came home, ate some lunch and went to the store to get some things that I needed to get for dinner. Once I had gotten dinner done I ate and watched some movies with the legs up, it was really nice. Here’s my awesome news for the day…So a couple of hours go by and I take the dogs out and while I am waiting I decided I would check my USAC rankings for whatever reason and wouldn’t you know it, all my hard work paid off with the final season tally ranking me at the top. 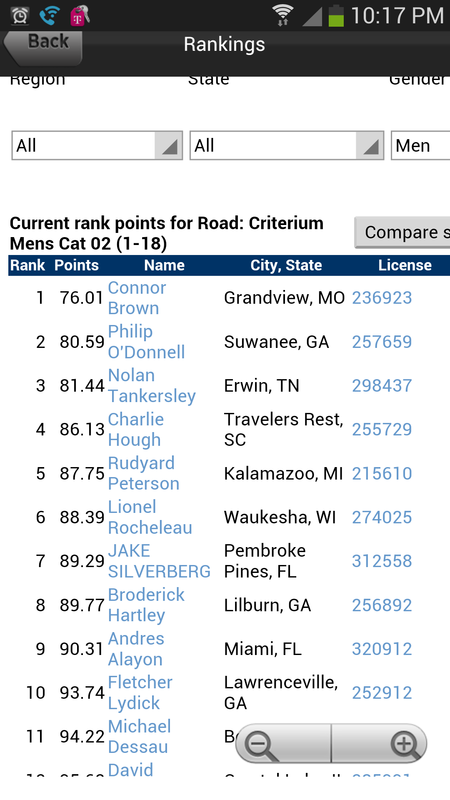 I am apparently now sitting first in all Cat 2 Juniors in the United States for crit racing. Its funny because I think that I am way better at road racing, but out here in the Midwest I guess we just have more crits than road races. Must be easier and less expensive to put on. Perhaps that needs to change, don’t you think? Congratulations, Connor!! Hard work pays off…keep it up! I am proud of you! !